Anna has collaborated with Hygge & West to create 6 different styles with 26 color options. All showcase her signature style and knack for fantastic color combinations. Peonies in yellow is cheery and bright. Anna, "I orginally made this pattern for a Rifle Paper Co. wrapping sheet and I've always thought that it would work great as wallpaper. It was one of the first patterns that we incorporated into the collection." Anna, "The pineapple patterns was the last one that we designed and it's turned out to be one of my favorites. I really wanted a more formal pattern that was in a grid rather than organic like the rest of the collection. Pineapples seemed like a fitting subject and we added signature florals around each one." 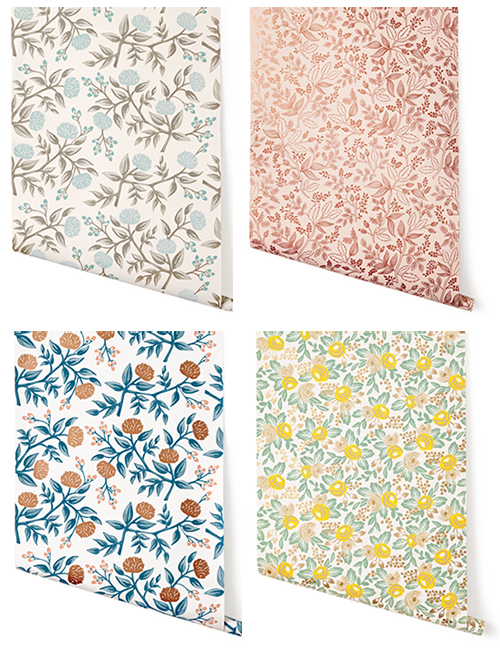 See Rifle Paper Co.'s entire wallpaper collection, here. And if you missed it, here's my wallpaper guide featured on Sweet Peach last year that has some fantastic wallpaper options, no matter what you're in the mood for.